actually doesn't have actual horns growing out of his actual head. an actual anti-woman, anti-feminist actual rant. 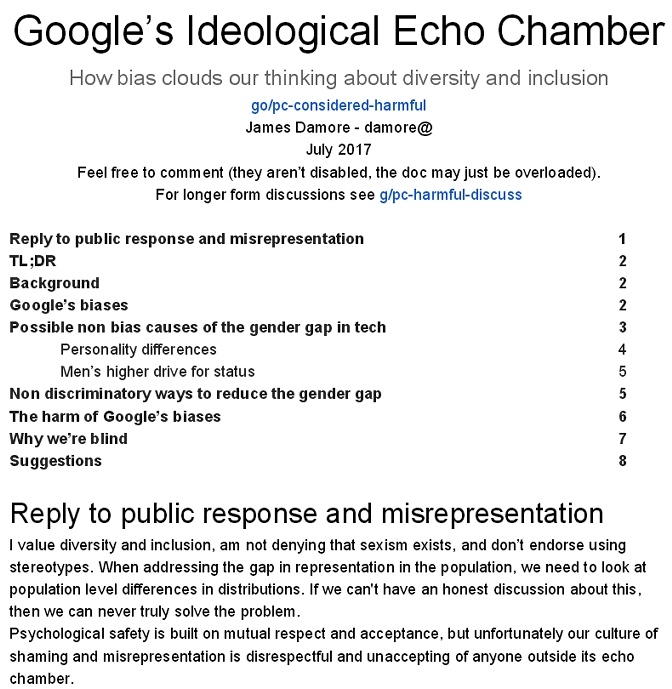 No, the Google manifesto isn’t sexist or anti-diversity. 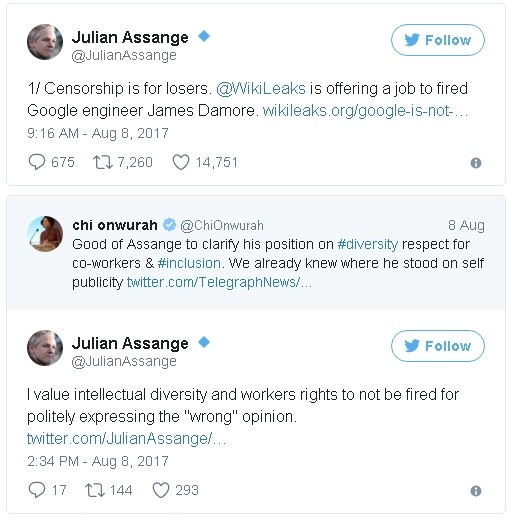 Did James Damore really deserve to be fired for what he wrote? Damore is careful to point out that the evidence for these claims does not show that all women have these characteristics to a higher degree than men. He says that many of these differences are small, that there is significant overlap between men and women, and that “you can’t say anything about an individual given these population level distributions.” He shows this with a graph, too. He says that to reduce people to their group identity is bad. I think it is. First, as I’ve said, it is not some twisted, crazy view. There are serious articles, published in leading peer-reviewed scientific journals, supporting it. Pichai, Google's CEO, says that “To suggest a group of our colleagues have traits that make them less biologically suited to that work is offensive and not OK.” But Damore explicitly, and more than once, made it clear that he was not reducing individuals to a group, and so was not saying that all — or even, necessarily, any — women employed by Google as software engineers are less biologically suited to their work than men. Google is a very selective employer, and so it is highly probable that Google’s selection processes have led to Google employing women who are, in specific traits, uncharacteristic of women as a whole. The target of Damore’s memo was the idea that we should expect women to make up half the software engineering workforce, and that Google should take measures directed towards achieving that outcome. For the 14th year in a row since 2003, men are the only ones who have ever made it to the finals of the Google Code Jam. In the wake of the company’s PR disaster with the leaked “Ideological Echo Chamber” memo and the subsequent firing of the man who wrote it, Google may not be too keen on promoting the event–or its finalists. Since 2003, Google hosted the international programming competition, sort of like the Olympics for programming geeks. Google uses the event to identify candidates for potential employment, recruiting tech wizards from all over the world—from the Philippines and Japan, all the way over to Russia, Sweden, and across the ocean to Latin America and the United States. Based on merit alone, the Code Jam does not make any considerations to contestants’ race, gender, political affiliation, or social status. It’s a test of pure skill—and the impartiality of the results speaks loudly. Women, as with anyone else, have entered the competition, but none so far have ever made it to the final around. This isn’t a fact that’s gone unnoticed, as keen-eyed Reddit users speculated on reasons for why that is.